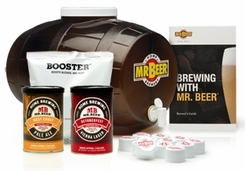 A TodaysConcept special, this kit includes the Mr.Beer Deluxe Beer Kit and an Octoberfest Vienna Lager Brew Pack. Now you don't have to wait to make the celebrated beer of famous German Oktoberfest. Brew keg is made from Advanced Rez-Tech Poly Vinyl Chloride, an FDA compliant plastic which imparts no taste or flavor migration, is lightweight, and shatter resistant.